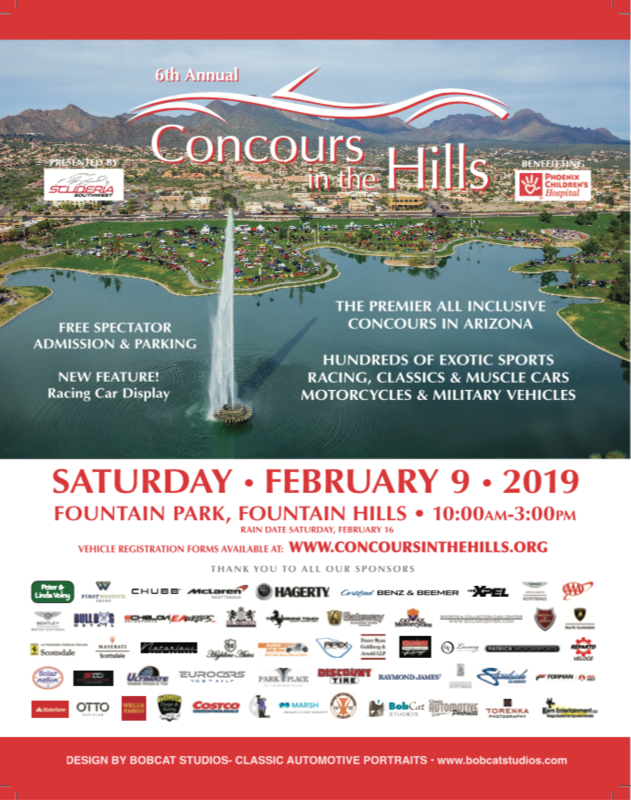 The Sixth Annual Scuderia Concours in the Hills auto show is scheduled for Saturday, February 9, 2019 at Fountain Park in Fountain Hills, Arizona! We lost the crown last year to Ferrari in number of cars at the event so it is time to take the crown back at the 6thAnnual event! Concours in the Hills is not a formal “white glove” event, but rather a casual and fun gathering of automobile enthusiasts in one of the most spectacular locations in the Phoenix area, on the green grass around the 560-foot fountain, one of the world’s tallest. The Concours showcases a diverse range of ultra-high performance, luxury, classic and racing vehicles from both imported and domestic manufacturers. These range from multi-million-dollar, 200 MPH plus cars to muscle cars, sports cars and pre-war classics, domestics and imports. The Concours is supported by the leading car clubs of Arizona representing Ferrari, Lamborghini, Porsche, McLaren, Maserati, Jaguar, Corvette, Viper, Ford GT, Lotus, Audi, BMW, Mercedes-Benz, Alfa Romeo, DeTomaso, DeLorean, Mustang, Cadillac and others. In 2018, they had 749 cars, 78 sponsors, over 20,000 spectators and raised $117,000 for the Phoenix Children’s Hospital. They have increased the display area for both exhibitors and sponsors so there should be no crowding and now use two entrances to speed entry. Based on registrations they aim to allocate enough space so that cars can open doors wide on both sides. The easiest way to register and pay is on line at the website: www.concoursinthehills.org under the “Register” tab. The entry fee is a minimum donation of $60 per car to Phoenix Children's Hospital. Please note that the organizers have established a strict “No Refunds” policy. Spectator admission and parking is free. In case of rain, the event will be rescheduled for February 16. We will not be meeting off-site this year to drive in as a group. In previous years, we had so many Porsches drive in as a group that we overwhelmed that area of parking cars. Such a problem! If you enter your car in the event, please make sure you arrive no later than 7:00 AM at the Concours in the Hills entrance to register and get parked in our Porsche area. The show officially opens at 10:00 AM and runs to 3:00PM. DJ music will entertain people of all ages as they walk around and enjoy all the cars. More food trucks will be added above what they had last year!